Hot off the press from Little Kulala Desert Lodge in Namibia. 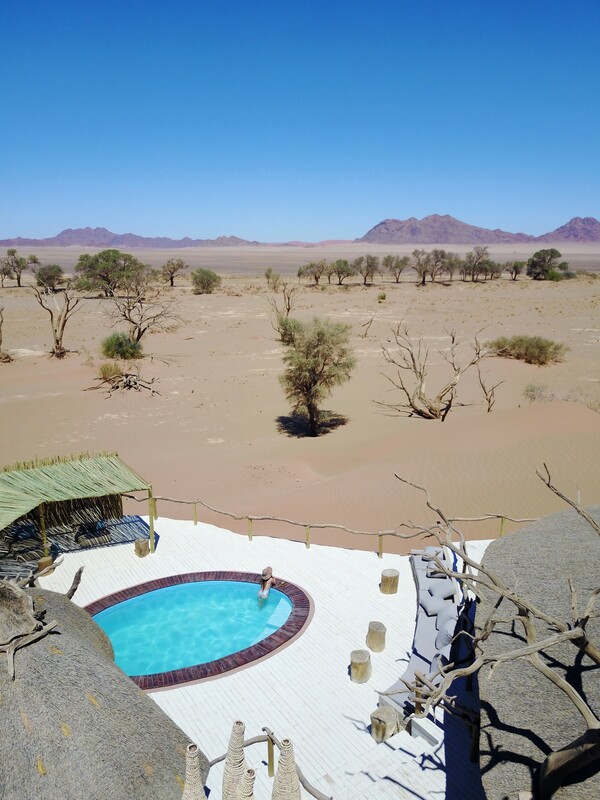 Situated on a private 67,000 acre wilderness reserve, Namibia’s Little Kulala Desert Lodge is an adventurer’s gem. The lodge is a quiet oasis amidst a backdrop of vast open desert in its most virgin form. Dramatic sand dunes line the horizon, while jackals, oryx and ostrich can be seen foraging around the desolate landscape. Little Kuala is a good 6-hour drive from civilization, so you can imagine how remote it is. Little Kulala Lodge is beautifully designed, keeping in harmony with the surrounding Namibian desert. The lodge features muted earthy hues while incorporating stonework and natural wood throughout. The main lodge and 12 creatively thatched guest “kulalas” make up the property. Each stand-alone kulala is equipped with a plunge pool, indoor and outdoor showers, and best of all… a rooftop star-bed. This is where we slept, lulled to sleep by the sky of myriad stars. We awoke to a vibrant sunrise dotted with hot air balloons. The trip was worth it just for this! Rooms are climate controlled (thank heaven!) and there is wifi, albeit somewhat spotty. The main lodge has a library, bar, lounging and dining areas, a boutique shop, and a wine cellar. This property can be booked through Roar Africa for a seamless desert vacation experience. What should you do with your days at Little Kulala? I took a day trip to Dead Vlei and Sossusvlei Dunes. These are must-see wonders! The beauty of this vast expanse of rich red sand dunes is beyond description. The dunes are purported to be the highest in the world, some reaching well beyond 1,000 ft. For a truly spectacular aerial view of the Kulala Wilderness Reserve, try a hot air balloon ride. Other popular activities are quad-biking, car safari, nature hike with a picnic, birdwatching, scenic Cessna flights, and enjoying a relaxing day by the pool. Little Kulala Desert Lodge provides guests with excellent meals. How they manage to get so many types of food into this remote area is beyond me. Meals are included in the cost of your stay. Menus are adaptable to dietary needs, including nice vegetarian fare and a children’s menu. Dieters be forewarned: they also bake their own delicious grainy bread! You’ll find most of the staff at Little Kulala to be enthusiastic and intuitive to your needs. Upon your arrival, be sure to ask them about all of the available activities so you don’t miss out. Sossusvlei or Dead Vlei are spectacular. You’ll want to make sure you’ve scheduled a visit in your itinerary. Children over 6 are welcome, and one of the kulalas is designed specifically for families. Remember to ask about this one if you plan to share your accommodation with more than two people. Lastly, bring along your strongest sunscreen and mosquito repellent to keep yourself protected. My last tip is to prepare for heat and enjoy the ride! I was hosted as guest of Wilderness Safaris and Roar Africa, but the opinions expressed in this article are, as always, my own.